IN the 1890s a young British engineer, Percy Pilcher, was living and working in Glasgow. He was interested in the experiments that other pioneers had carried out in their attempts to fly. He resolved to design and build his own flying machine, in the hope of being the first to fly a heavier-than-air aircraft in Britain. In 1895 he succeeded in flying his Bat Mk2 (pictured above) in the hills above Cardross, north of the Clyde. He flew it many times, and demonstrated that he was able to control the machine in flight. He therefore deserves to be regarded as having carried out the first successful flights in Britain. The idea of building and flying a replica to mark the anniversary of this achievement was first mooted in 1985, one hundred years later. However, this did not happen, and gradually the project developed until, on the announcement of the building of the new Riverside Museum in Glasgow, it was decided to try to build a reproduction of the glider to be displayed in the new museum. A small team from both Spirit AeroSystems and BAE Systems at Prestwick, Ayrshire in Scotland, have been working on this project for nearly 10 years in their spare time. 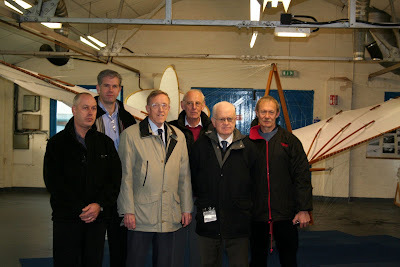 The reproduction of the Bat Mk2 has now been finished, and was handed over to the museum on Thursday 13 December 2007. The glider will go into storage until the museum opens in 2011. 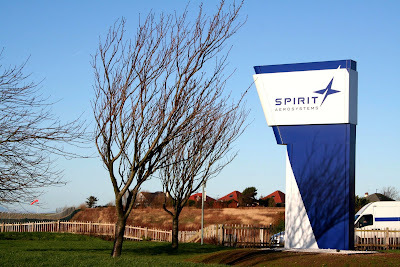 Spirit AeroSystems (Europe) Ltd is based at sites in Prestwick, Ayrshire and Samlesbury, Lancashire. The Prestwick site is home to around 750 employees, and is one of the largest employers in the local area. An additional 80 staff are based at Samlesbury. The business provides customers in the commercial aerospace market with airframe structures. At manufacturing and engineering levels, this involves producing leading and trailing edges for Airbus wing assemblies, leading edge production for Boeing wings and the manufacture of tail-planes, and ventral tanks and other items for Hawker Beechcraft. Spirit Aerosystems works closely with its customers, and is involved in the development of innovative production methods and procedures which are achieved through its global supply operations. Relationships with suppliers based across Europe, the USA, the Far East and South Africa have been developed to help deliver cost and efficiency savings back to customers. One of the company’s key strengths lies in the development of engineering and manufacturing procedures in its UK sites, and then exporting that expertise through its global supply chain. This minimises production costs, while still maintaining Spirit’s in-house levels of quality and precision. Formerly a division of BAE Systems, the business unit was purchased by Spirit AeroSystems Inc. in April 2006. Spirit Inc. with it’s headquarters in Wichita, Kansas, is the leading supplier of airframe structures and systems in the commercial aviation market.